Mesotherapy is an aesthetic treatment where a specialised cocktail is injected via injection gun or by hand into your scalp giving a vitamin boost which can improve the blood circulation in this area, rehydrate and nourish weak hair follicles and encourage re growth. Both men and women who suffer from thinning and hair loss may benefit from this treatment and has also been shown to delay male pattern baldness. 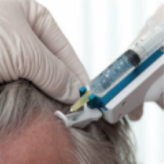 Mesotherapy for hair loss - does it work? You may need as many as 10 or more sessions of this mesotherapy treatment for hair loss over a period of six to nine months before you see significant results. There is some swelling and rarely bruising to the injection site may occur that will last a few days but could be helped by applying a cold compress and taking mild painkillers such as Paracetamol.